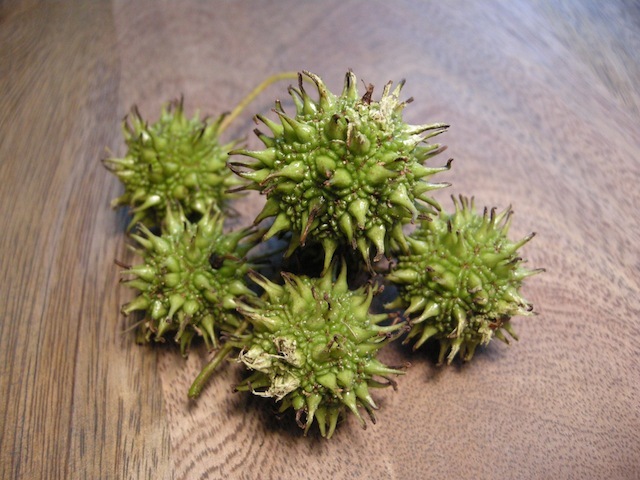 Prettier than pecans, with a dangerous attitude, sweetgum balls have also been shaken out of their trees this week onto the streets. Don’t they look like something a Medieval torture specialist would have slung over his shoulder? These might end up sprayed gold, dangling from a Christmas tree. Assuming we actually break down and buy one. The pressure is on, with family coming. We haven’t had a “live” tree since the first year we were married, when in the bliss of newlywed-dom the Mr. tested his allergies for love. Unfortunately, that tree was amazingly fragrant. We took all the ornaments off and flocked it, thinking that might somehow block whatever made the Mr.’s eyes bulge red. Didn’t work. That year, and for quite a few more, we retrieved a 1970’s vintage “bottle brush” tree from my parents’ attic. Ugliest tree ever. Then we broke down and bought a nice one, which we finally retired this summer when we moved. It’s happy news when the marriage outlasts a few faux evergreens. Although the ritual of hauling it out and decorating it can be a source of friction. The Mr., frankly, is pretty indifferent about the whole business. Now, the conundrum is limited square footage, and I was surprised to see the plethora of small-space options out there. A category called “slim” trees seems to be coming on strong, some of them about 40 inches wide at the base. And beyond “slim,” there’s the “pencil” shape – which looks positively anorexic. Many look quite lifelike, and their designs have moved way beyond bottlebrush into forms and needles that mimic nature. Blue spruce, anyone, or Aspen fir? 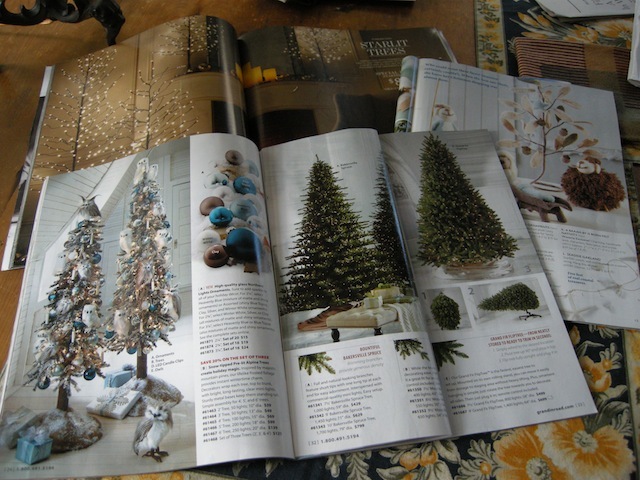 It makes me laugh that at Balsam Hill, which appears to be a good online source, the choices are broken down by “Most Realistic,” “Realistic” and “Traditional.” Traditional apparently meaning that you accept the tree is fake, so who cares if it looks like it was just plucked from the Blue Ridge Mountains? And lights! You’d have to be crazy anymore to buy one that isn’t pre-lit, at least until you think about it for a minute, since you know those PVC branches are going to outlast the bulbs. And then what? This entry was posted in Little Lessons and tagged Christmas tree, square footage, sweet gum on November 28, 2012 by Molly Glentzer.